West Oz Wakeboarding has been in operation for 13 years. It started off with just three people and now has over 60 members. It runs competitions from Bonneys ski park in Perth, just off the Mundijong road exit from the Kwinana Freeway. West Oz Wakeboarding focuses on the expansion and development of the sport of wakeboarding in Australia.  West Oz brings like minded people together where they can exchange ideas, compete and have fun. Five grass root events are conducted each year as well as one state title event and the Cory Peach Memorial. 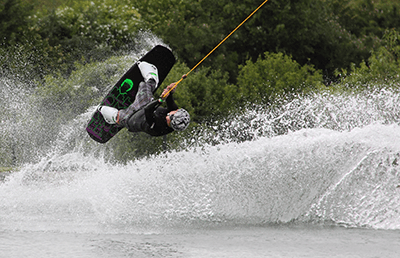 Riders of all ages and skill level are welcome to become members of West Oz Wakeboarding. Tony Finn of California, USA is credited as the inventor of wakeboarding in 1979. The idea came about as a result of frustration when surfing. When there are no waves, surfing is impossible. Tony discovered that by being towed behind a motorboat the increased wake (a trail of disturbed water or air left by the passage of a ship or aircraft) allowed one to somewhat surf. The noun “skurfer” and the verb “skurfing” were then coined to describe the board and the sport respectively. 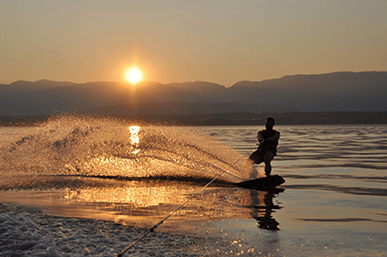 By the 1990s, the term “wakeboarding” had come into widespread use. 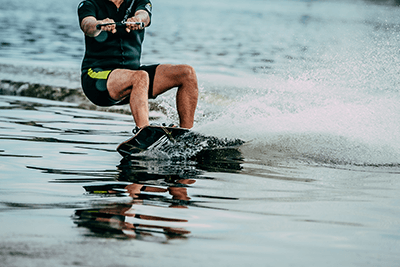 Wakeboarding has been influenced by other water skiing disciplines such as barefoot and trick water skiing. It also combines some snowboarding and skating elements. It can be performed on dams, lakes and the open sea. The rider rides sideways on a short wide buoyant board that’s similar to a snowboard while being towed by a motorboat. The rider then uses the boat’s wake as a launch ramp to perform a variety of tricks. These could be grabs, flips, spins, jumps or any other trick depending on skill. The heavier the boat, the bigger the wake generated. During competitions, riders perform a two-pass run with the boat travel in a straight path. Riders are scored on the total use of the course including obstacles and tricks as well as the difficulty and proficiency of the moves executed.  The Association is committed to helping individuals and families safely enjoy the sport of waterskiing and wakeboarding throughout Western Australia. We represent all disciplines of our sport to people of all ages, levels and abilities. We assist each member with the necessary skills and opportunities to participate, ranging from the social to elite athlete.